Dr. Megan Lawler reviews the cutting-edge neuroscience that can lead to personal growth strategies to effect positive changes in our brain after age fifty and how “elderhood” can be a healing force in society. 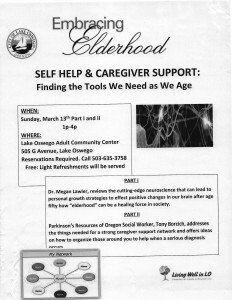 Parkinson’s Resources of Oregon Social Worker, Tony Borcich, addresses the things needed for a strong caregiver support network and offers ideas on how to organize those around you to help when a serious diagnosis occurs. Light refreshments will be served. Reservations are required, please call 503-635-3758.